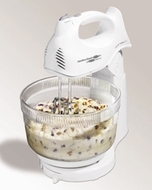 Traditionally, a stand mixer's main purpose has been preparing ingredients for baked goods. With the right attachments, modern stand mixers can perform a variety of other functions - from grinding meat to making pasta. If you don't want your counter space to be taken up by a stand mixer - consider getting a more compact hand mixer.